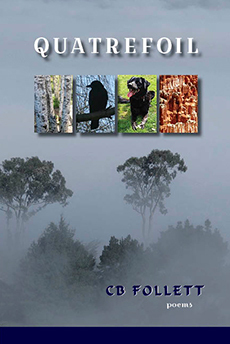 Quatrefoil is a collection in four sections: Tree Music (poems about trees); Congregation (poems based on collectives such as Murder of Crows, Ostentation of Peacocks, Clowder of Cats etc. ); An Island of Bones (poems about dogs) and Poems for Red Canyons (poems about the Four Corners Area of the Southwest). for the soft whistle of my half notes. each of these are what trees know. grasses, and their I Am Here. out his song for all the girls to hear. a whiff of vodka, steak, fish. At home is good news. of hills, digging holes, fur and spore. scuffed leather and deep treads. to click the floor like castanets. inclusion, and all out running. They lead to jacket and leash. These are the shoes of happiness. overflow and wash out a burrow or cabin. when the maw of a cave takes on the sound of wind. where my tentative foot seeks the gully at the bottom. along every path or non-path. I overlook; harmony unfolding around me. What a lovely, moving, really substantial book...I started to make a list of my favorites ("Where Air Grows Thin," "If I'd Grown Up Here." "Six Horses," "Writing the Political Poem"...) but then realized the list would be way too long." "Follett's poems dwell in the understory, and they are...awash in the primordial sea. In their breadth, they are universal by employing incantation, lyrical nuance, and the natural music of language. The poems convey intense emotional and humanistic involvement...they are close to the breastbone of the poet and the reader alike; they aim and find their target with laser-like precision." "...accomplished poetry of considerable imagination and an undeniable flair for language, Follett's unique style of engagement is to be admired, even savored, poem by poem and verse by verse."